Illinois State University student Alex Campbell announces his Normal Town Council candidacy Monday, Dec. 3, 2018. An Illinois State University student is running for Normal Town Council. Junior marketing major Alex Campbell announced his candidacy to a crowd of students in an ISU classroom Monday night. 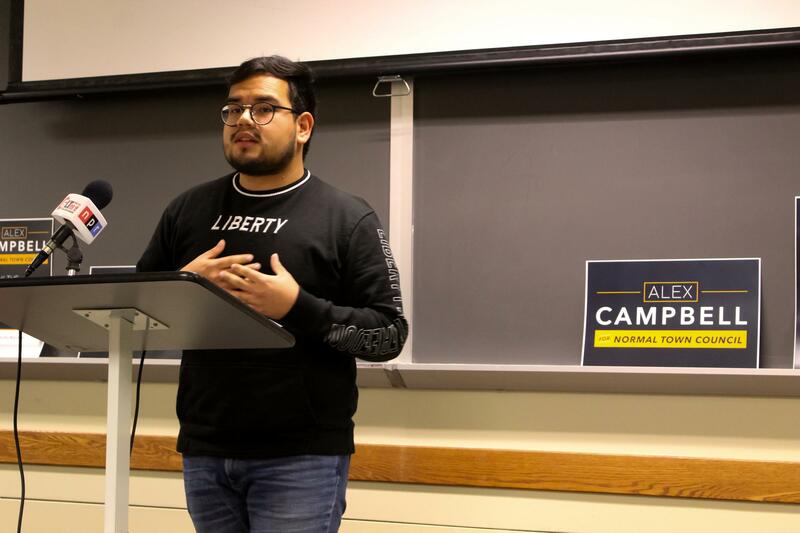 Angel Zamudio works on Alex Campbell’s town council campaign and alongside him on ISU’s Student Government Association. He said Campbell’s campaign is about students, run by students, and made for students. Angel Zamudio works on Campbell’s town council campaign and alongside him on ISU’s Student Government Association. Emily Patterson also works on Campbell’s campaign. She said in his role on the university’s Student Government Association, Campbell is an advocate for underrepresented students. Patterson said Campbell’s election to the Normal Town Council would close the divide between university students and the town. If elected, Campbell would be the first student and youngest-ever member to sit on the council. He said his first matter of business on the council would be to draw attention to real estate companies who take advantage of student leasees. Campbell is running against seven other candidates in the April election. Each will appear on GLT's Sound Ideas in the coming weeks.